We arrived at the park the other day and it was too cold for the sprinklers, even though it was on. It was the first time this year the girls had seen the sprinklers on and they were excited and ready to hop in. We didn’t have their bathing suits on, but wanted them to take part in it somehow; they had on their water shoes (they wear this almost all spring and summer in or out of the water), so we let them jump in the largest puddle that was created by the sprinklers. S O M U C H F U N!!! Seriously, the kids can teach us a lot about how to be adults, what’s really important in life, the simplest ways on how to be happy and live in the moment . These Keen watershoes, they live in all Spring and Summer. I would probably let them in it all year if the weather didn’t get cold. No socks shoes weather equals a huge win in this home, since it’s always a struggle to find matching socks! We must have had a pair every year for the past 4-5 years since our first baby was born. They held up so well, we are giving the little ones away to a family friend and the other hand me downs are happily being worn from one kid to the other. My husband and I also own a pair and it’s held up to every trip we’ve taken. 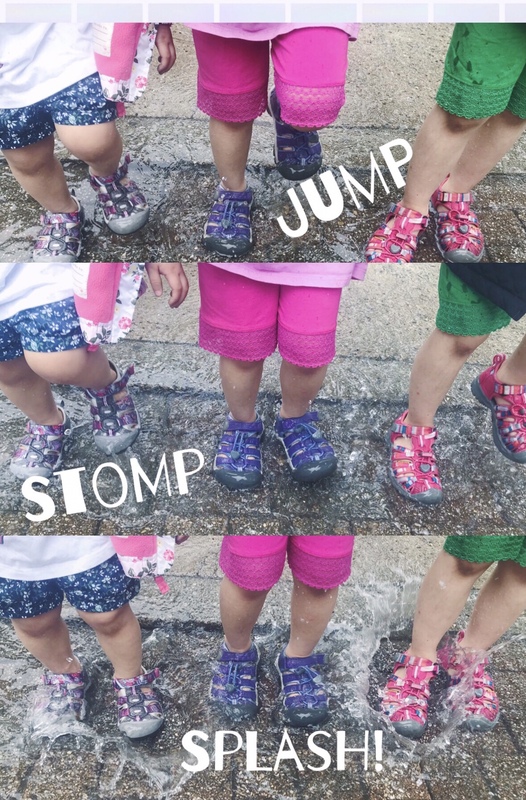 We also love Keen Watershoes because they have excellent grip; you should see them walk up and down the slide in the park without any problem at all, while some other kids are struggling (however, we don’t let them do that if there are other children waiting for their turn). We like that they are lightweight and feels very comfortable on our feet. We wear them around cabins and cottages, or wherever we end up staying for our trip if slippers aren’t available because they are easy to rinse and leave to dry to if you don’t want to bring multiple shoes for vacation. They dry quickly too. Packing Watershoes, sneakers, sandals, slippers and rainboots for a vacation is just not possible (especially since we have 3 kids, plus the two of us adults). These shoes are are one shoe for all. You can also add socks if you wish for chillier days or if you are going on hikes. Spring can bring about quite a few amount of those rainy days and random sprinkles or thunderstorms. With light rain, we don’t even have to put in rain boots for Olivia when she goes to school because the Keen dries up well. Even when it’s not dry, it’s comfortable when wet because of the material of the padding of the watershoe (it’s not cloth-like fabric, but kind of feels like the material from crocs?). It’s a bit like wearing crocs, but better foot support and as “slip-proof”, as a shoe can be. Well, there goes my praise for the Keen Watershoes! You would think I work for them I love their shoes so much. I hope you give them a try if you are looking for shoes to wear all spring and summer! What are your favorite sandals, water shoes, hiking and/or “do it all” shoes you wear all summer? Do you own a pair of Keens?